The MS2540 Receiver is designed to be used with our ER and LPR current loop transmitters to provide a single-channel corrosion monitoring system. 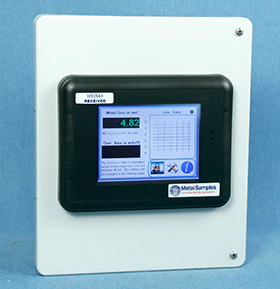 The MS2540 provides a local display of the probe and transmitter data. 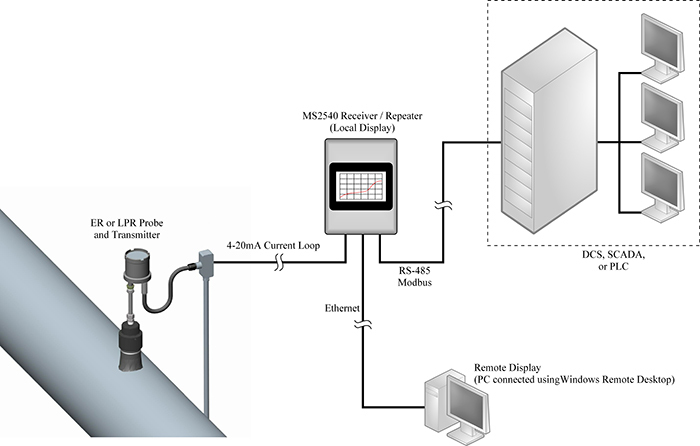 Additionally the MS2540 can repeat the information to a plant control room via RS-485 Modbus. The MS2540 utilizes a color touch screen to display information and present user controls. The unit is powered by 100-240 VAC, and provides the 24 VDC supply for powering the transmitter's 4-20 mA loop. The receiver processes the 4-20 mA signal to provide a digital readout of the cumulative metal loss and the probe corrosion rate based on the monitoring period set by the user (48 hours, 7 days, 15 days or 30 days). The MS2540 also offers an integrated web server. This feature allows users to access the MS2540 from any PC on the network using a standard web browser. Through this interface users can view data and make setup changes to the MS2540.